Mary Catherine Johnson, 68, of Lima, Ohio and formerly of Springfield, Ohio passed away September 24, 2018 in St. Rita's Medical Center in Lima, Ohio. She was born November 26, 1949 in Springfield, Ohio the daugter of Fairest Hayes and Janice Gaines. She was a member of the Church of the Living God and had been employed at the Ford Motor Company and Lima Convalescent Home. 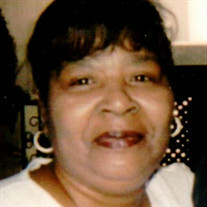 She leaves to cherish her memory a son, Darrell Newby; daughter, Dana Newby both of Columbus, Ohio, 10 grandchildren, 11 great grandchildren; brothers, Adrian Gaines of Springfield, Ohio, Fairlond Hayes and William French both of San Diego, California; sisters, Joyce Hayes and Crystal Hayes both of Columbus, Ohio, Niecy Gaines and Violet French both of San Diego, California and a host of other relatives and friends. She was preceded in death by her brothers, Kenny Gaines, Fairest Hayes Jr. and James Stevie Hayes who passed away one day after Mary; sisters, Marlisha Mozee, Tommy Elise Mozee and Rolina Nicholes.